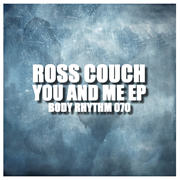 Ross Couch – You And Me EP – Body Rhythm 070: Out Now! It’s been a hectic time here recently as I’ve been working on a number of different remixes for labels, but I’ve not been neglecting my own original material and I’ve got a new EP out today to prove it. The ‘You And Me EP’ features three brand new tracks hot off the press and you can get your hands on them now on Traxsource promo.